← Discrepancies in interpretation – when can exomes speak from themselves? CNV. Structural genomic variations or Copy Number Variations (CNVs) significantly contribute to the genetic architecture of many neurodevelopmental disorders. However, given the enormous variation in the human genome in healthy individuals, the precise contribution of CNVs remains poorly understood. In a recent publication in PLOS Genetics, we were able to assess the microdeletion architecture in more than 1,000 patients with Genetic Generalized Epilepsy (GGE) compared to more than 5,000 controls. We found that microdeletions occur almost twice as often in GGE patients compared to controls, an analysis that revealed both known suspects and interesting candidates. The CNV revolution. The genomic age in epilepsy genetics started with Copy Number Variations. Prior to our discovery that we can use genome-wide screening platform such as Single Nucleotide Polymorphism (SNP) arrays or array comparative genomic hybridization (array CGH) for the analysis of genomic imbalances, we were pretty much limited to candidate genes. Back then, in the pre-genomic era, candidate genes were pretty much synonymous with SCN1A and everything else was extremely rare. We stumbled onto the role of CNVs in epilepsy virtually by accident. We were able to analyze a large cohort of GGE patients and controls for microdeletions. This cohort, the EPICURE cohort, was initially recruited for a genome-wide association study, and CNV analysis started out simply as an interesting side project. Paradoxically, it turned out to be the most productive area of genetic analysis for common epilepsies – a statement that still holds true in the era of large-scale exome and genome sequencing. Candidates. Back in 2007/2008 we first assessed the role of several candidate microdeletions such as 15q13.3, 16p13.11 and 15q11.2 and found that they significantly contribute to the genetic risk for GGE/IGE. At the time, we refrained from looking further into this data – the EPICURE cohort was genotyped by SNP arrays, which make it notoriously difficult if we try a global assessment, as there were vast differences between batches, genotyping centers, and DNA qualities. Back then, answering the bigger question about the global CNV burden in IGE seem out of reach – in our recently publication masterminded by Dennis Lal and Thomas Sander, we were able to overcome these limitations by rigorously controlling for artifacts and outliers. Here is what the CNV landscape in GGE/IGE looks like. Recurrent microdeletions. In the current cohort, which is virtually identical to our previously published cohorts, recurrent microdeletions are basically limited to the known hotspot deletions. In contrast to our previous studies, the spectrum of these deletions has increased and now includes microdeletions at 1q21.1, 15q11.2, 15q13.3, 16p11.2, 16p12, 16p13.11 and 22q11.21. This is one of the main findings in our current publications – even in a cohort that large, there are few recurrent deletions other than known hotspot deletions. 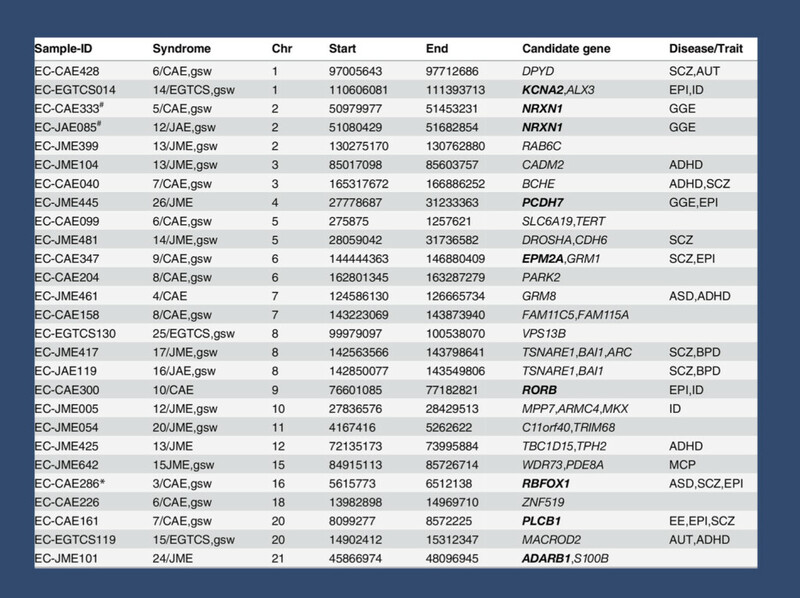 Of the 103 microdeletions identified in patients with GGE/IGE, almost 40% are accounted for by these hotspot deletions, which traditionally present with a wide range of neurodevelopmental disorders. When taking the hotspot deletions out, the almost 2-fold excess of deletions in patients compared to controls becomes non-significant. Almost 4% of the heritability of GGE/IGE is explained by microdeletions, and virtually all of this is explained by hotspot deletions. However, there are also very interesting findings in the non-recurrent deletions. Non-recurrent deletions. As the next step, we looked at deletions that were only found in patients with GGE/IGE and not in controls. There is no good way of generating any meaningful statistical measurement for this, as the frequency of these deletions is only marginally higher than in controls. Nevertheless, also these non-recurrent deletions give us some insight into the biology of GGE/IGE. First of all, there are deletions that span the same gene in two cases. There are two patients with overlapping deletions of the NRXN1 gene, coding for Neurexin 1. NRXN1 deletions are a well-known risk factor for neurodevelopmental disorders. More surprisingly, there are also two deletions spanning both the neighboring TSNARE1 and BAI1 genes, encompassing the genes encoding the t-SNARE domain containing 1 protein and the brain-specific angiogenesis inhibitor 1. Both genes were previously entirely unknown to me. Other than these two overlapping deletions, there are no further recurrent or overlapping findings. There are various interesting single gene deletions including heterozygous deletions for recessive neurodevelopmental disorders including VPS13B, EPM2A, and PLCB1. In addition, there is one patient with a deletion in KCNA2, reinforcing the idea that the more severe epileptic encephalopathies are due to activating or dominant-negative mutations but suggesting that perhaps milder phenotypes might be associated with haploinsufficiency, as is seen in KCNQ2. This is what you need to know. The current publication by Lal and collaborators is the definitive study on the CNV landscape in GGE/IGE. The study nicely demonstrates that there is an excess of microdeletions in GGE/IGE, which is largely accounted for by recurrent hotspot deletions. However, there is an intriguing clustering of other candidates within the non-recurrent deletions, suggesting that at least some of these variants are contributory as well. Our current publication further reinforces one important point: GGE/IGE is closely related to other neurodevelopmental disorders including autism, intellectual disability, and schizophrenia on the genetic level. This remains to be a highly unusual concept for an epilepsy that has relatively little comorbidity and, in the vast majority of patients, has little clinical overlap with these conditions. This entry was posted in 2015, Bioinformatics, Consortia, EuroEPINOMICS, Familial epilepsies, IGE/GGE and tagged CACNA1H, Childhood Absence Epilepsy, duplication architecture, EFHC1, GABRG2, Genetic Generalized Epilepsy, hotspot deletion, Idiopathic Generalized Epilepsy, juvenile myoclonic epilepsy, KCNA1, microdeletion. Bookmark the permalink.